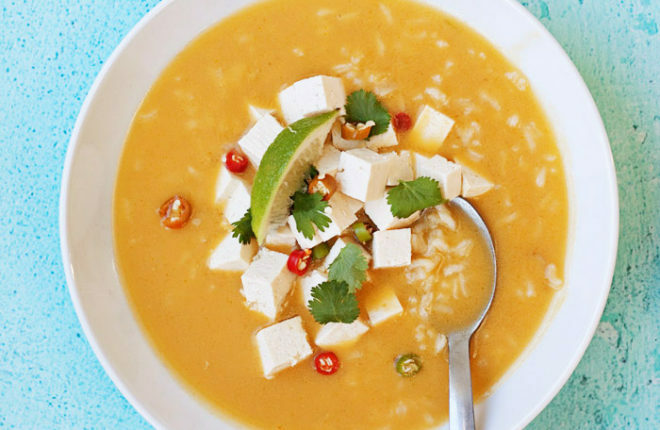 A simple soup bulked up with rice and influenced by Thai flavors. It simmers up vegan, then simply ladle into bowls and pile with your protein of choice (tofu for the vegans, chicken for the carnivores). Perfect for when omnivores and vegetarians/vegans dine together! 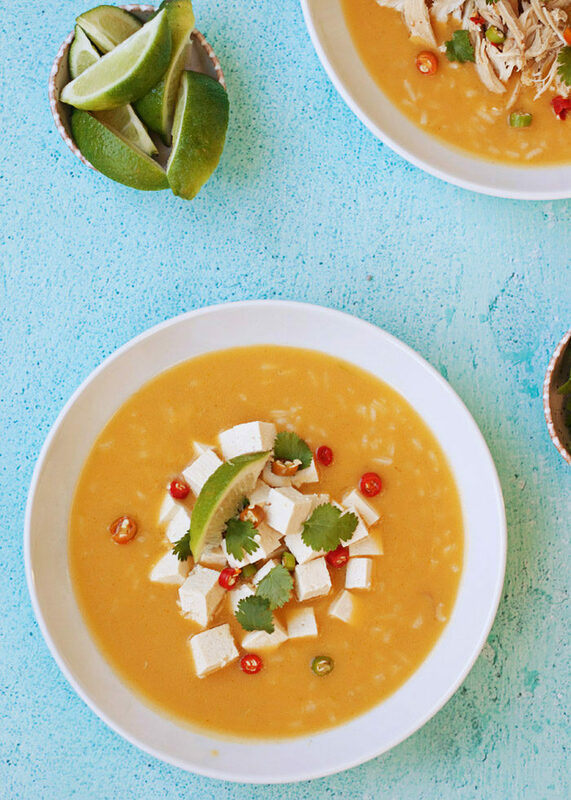 I woke up in a panic, but also with an idea in my head: a simple coconut milk and lime soup with Thai flavors and a good amount of rice simmered in – one that would be perfect topped with either tofu or chicken. Or, apparently, served alongside giant caterpillar. So gross. So weird. So sorry. I promise I don’t do drugs. 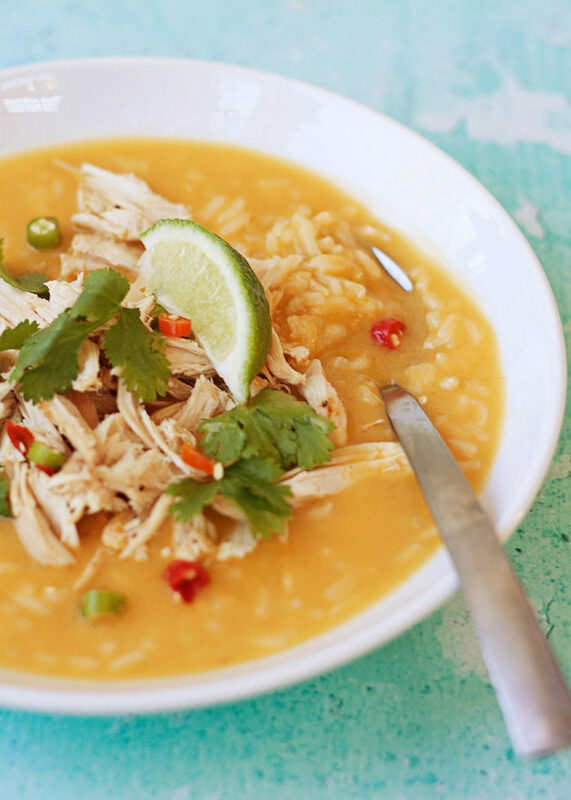 By afternoon, I had simmered up this superb Coconut Lime Rice Soup and was totally in love with it. I almost can’t wait for the next time I get a cold so that I can see if it’s the magic elixir I think it might be. I know, I know, don’t tempt fate, right? 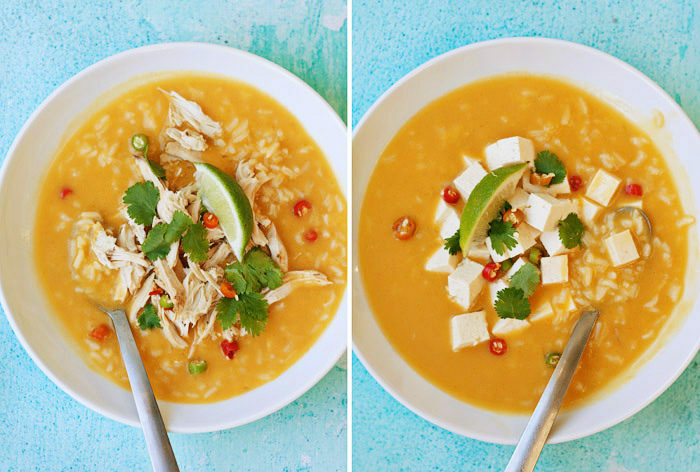 I love love love this soup for its One-Dish-Two-Ways versatility. 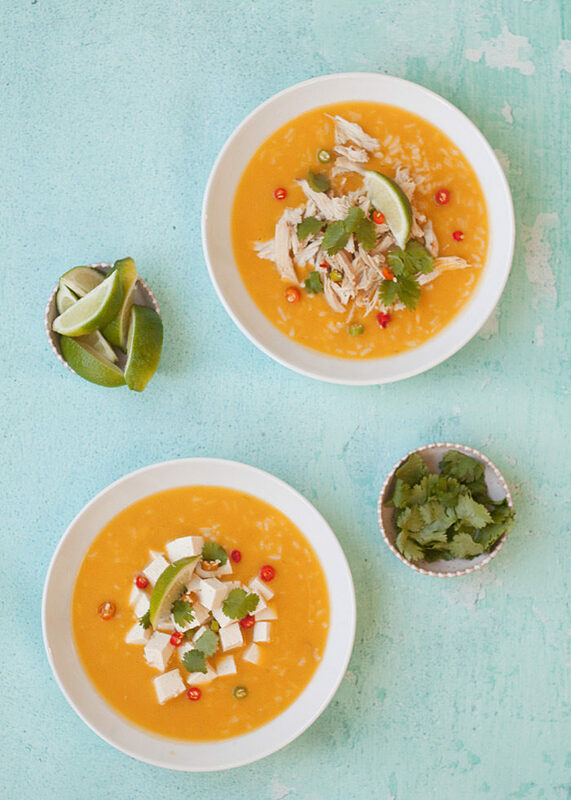 The soup cooks up perfectly vegan, and then the protein is in the toppings – shredded chicken for Mr. Carnivore (no Hawaiian um, meat, sorry babe); cubed tofu for Ms. Meatless (that’d be moi). Set a medium saucepan over medium-high heat. 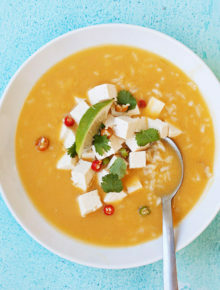 Add broth, coconut milk, rice, ginger, lemongrass, chiles (if using), and 1/2 teaspoon salt. Stir and bring to a boil. Reduce heat to low and cover. Simmer until rice is tender, about 20 minutes. Remove from heat. Using a slotted spoon, pick out the ginger, lemongrass pieces, and birds-eye chiles and discard. Stir in lime zest and lime juice. Taste and add additional salt if desired. 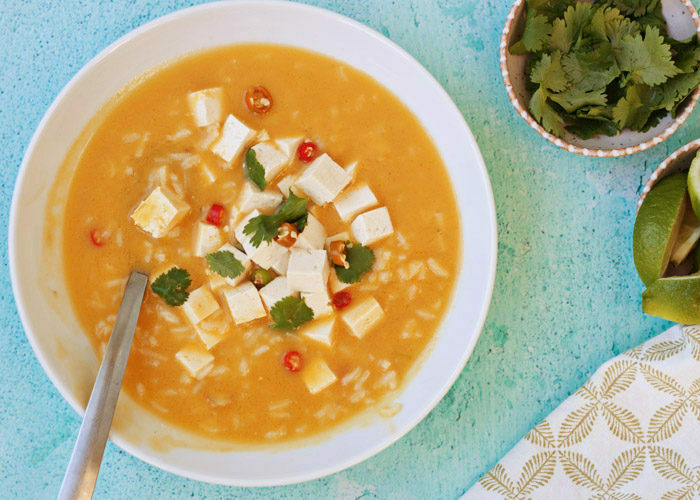 Ladle into bowls and top with a generous amount of tofu or chicken. Add garnishes – I like lots of fresh cilantro, sliced peppers, and an extra lime wedge for squeezing. Serve. Leftovers keep refrigerated in an airtight container for 2-3 days. Note the soup does thicken up over time because the rice continues to absorb the liquid. But it still tastes delicious! * Find lemongrass at your local well-stocked grocery store or Asian market. To prep, lop off the grassy end and and the bottom inch or so. Then cut off a 3-inch piece of what you have left. Slice it in half lengthwise then crush each half lightly with your knife to help release the oils. ** The chiles add a tiny amount of heat. Crush them before adding if you want more of a punch. I use Thai Kitchen brand, found in the Thai food section of my grocery store. I love all the ingredients. Thank you for sharing! that “i have a dream” sparked me singing all the dream songs from “mamma mia,” “tangled,” and “les mis.” and then you mentioned “top chef,” so i imagined all those girls singing and cooking, with the caterpillar from “a bug’s life.” whew. anyways, on a less weird note, this sounds delicious! perfectly cozy, especially since it’s all stormy in southern california. i’m surprised by how vibrant this looks given the ingredients, but love the color anyhow. Haha, I’m glad I’m not the only one who has ear worms take off in her head! 🙂 Oh my gosh, it’s because the broth I used was really orange, but I really wanted to share the recipe, so I went with it.